Often during MEP elements modeling, you need many drawing sections which can be a tedious task and decreases productivity. Aligning a section to an object can take many clicks and selections. You must watch out for eye mistakes that can end up picking a wrong direction for your selection. In addition, resizing the section crop region for an object can be time-consuming. Using this app, now it is easy to choose the object and all the calculations are done with just one CLICK! This is a paid version and it checks your Autodesk user ID online, but if you want to use it offline you shall run the Revit as administrator online just once. A trial version is also prepared for you to test the app, you can find it HERE in the app store. Five stars! Must be incluided in the revit native options! 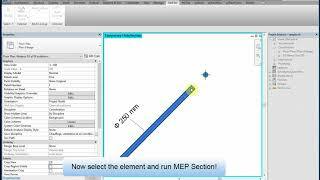 The fastest tool for MEP model to draw cable trays , ducts and pipes. Must be incluided in the revit native options! Very usefull and time saving app for a mep modeler like me. No more pains for sections :). Thanks. Wow! It's seems very easy to use. Modeling Mep is impossible without Section... Some time you need more than 50 sections in an hour when you are modeling fast. And in large models it's really waste time to draw and crop sections each time. This app looks like a gift from the heaven!